THE PRINCETON-HIGHTSTOWN BYPASS: The concept for the Hightstown Bypass first appeared in 1929, when local officials sought a solution to redirect through traffic from downtown Hightstown. In 1938, state officials proposed legislation for a "Route 31A," an expressway running from just west of Princeton through Hightstown, and east to the Atlantic Ocean along the NJ 33 corridor. My studies have very definitely indicated that it is unwise to expect city streets to bear the brunt of through, truck and passenger traffic. A continuous line of trucks, or, for that matter, passenger cars, bound from the Trenton area to the seashore, or desiring to get on the (New Jersey) Turnpike after it is completed, may constitute a (brick wall) "Chinese Wall" just as effectively as an underpass or overpass. In the late 1950's, the New Jersey Highway Department unveiled plans for the Princeton-Hightstown Bypass, a four-lane, 14-mile freeway connecting US 206 in Montgomery Township with NJ 33 in East Windsor Township in northern Mercer County. The proposed Princeton-Hightstown Bypass, which was then re-designated NJ 92, was to connect US 206, NJ 27, US 1, US 130 and NJ 33 with the New Jersey Turnpike. The western terminus of the NJ 92 Freeway was to be at the unbuilt section of I-95 near Rocky Hill. The project commences at the intersection of County Road 571 and Windsor Center Drive and terminates at the intersection of NJ Route 33 and Milford Road, East Windsor Township, Mercer County. All construction is on an alignment crossing over a total of seven existing arterial roadways and drainage waterways. Over a million cubic yards of embankment fill will be put in place. Prior to bid, the Department of Transportation obtained key initial environmental permits. The Design-Build team is addressing environmental wetlands and endangered species issues and is securing the final permits. 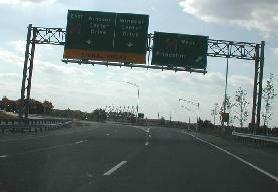 The NJ 133 Freeway begins at NJ 33, just east of the New Jersey Turnpike near EXIT 8 in Hightstown. Crossing over the New Jersey Turnpike, the freeway continues west around Hightstown. A three-quarter cloverleaf interchange is provided at US 130, and a partial diamond interchange is provided at One Mile Road. The freeway ends at Mercer CR 571 in East Windsor, just east of Mercer CR 535. Traffic lights are located at the eastern and western termini of the bypass. After four decades in the planning stages, and nearly three years of construction, the NJ 133 Freeway opened to traffic on November 30, 1999. The final construction cost was $65 million. Possibly owing to community opposition along the route, the NJ 133 Freeway has more and sharper curves - and therefore shorter sight distances - than the average new freeway. To provide an added margin of safety, the NJDOT established a 45 MPH speed limit along the entire length of the freeway. (This limit was raised recently to 50 MPH.) Continuous sound and visual mitigation measures, consisting of both natural vegetation and sound walls, were implemented close to the edge of the roadway. DEFININTION OF MODIFIED DESIGN-BUILD: The NJ 133 Freeway was the first "modified design-build" project in New Jersey to take advantage of the time saving and cost-cutting benefits that such projects were expected to offer. Under "modified design-build," the NJDOT must provide more qualitative information up-front to interested bidders than it would under conventional "design-build." With "modified design-build," the NJDOT prepared plans so that design is approximately 35 percent complete, compared with 10 percent complete before bidding commences under conventional "design-build." Time and cost savings are realized because design and construction are phased so construction commences as portions of the design are completed. According to the NJDOT, the "modified design-build" nature of the project has shaved 26 months off the overall design and construction time. The existing EXIT 8 on the New Jersey Turnpike (I-95) should be relocated to intersect with the NJ 133 Freeway, providing direct access between the two controlled-access highways. SOURCES: Regional Highways: Status Report, Tri-State Transportation Commission (1962); Transportation 1985: A Regional Plan, Tri-State Transportation Commission (1966); New Jersey Highway Facts, New Jersey Department of Transportation (1967); "Public Hearing for Proposed Route 92 Freeway," New Jersey State Legislature (12/17/1991); "New Jersey's Modified Design-Build Program: Hightstown Bypass," Federal Highway Administration and New Jersey Department of Transportation (June 1998); "Hightstown Bypass to Ease Congestion" by Dorothy Fischer, Mercer Business (8/01/1999); "Long Wait Is Over" by Michael Arnone, The Trenton Times (12/01/1999); "Market-Based Solutions for Peak-Hour Congestion in the Trenton-New Brunswick Route 1 Corridor" by Meghan K. Fehlig, Princeton University (2002); Phil Case; Steve Kimmelman; Raymond C. Martin; Christopher G. Mason; Dan Moraseski; Mike Pepe; Charles Toutant; Randal Wilson; William F. Yurasko. NJ 133 and NJ 92 shields by Ralph Herman. NJ 133 exit list by Ray Martin.